In addition to the House Concerts, we will, from time to time, organize and present a show in larger venues, such as clubs, cafes and theatres in and around the Triangle area. Past shows have included events at The Skylight Exchange, The Durham Armory, The ArtsCenter in Carborro and The N.C. Museum of Art. Tickets for these other shows are usually purchased through traditional ticket outlets instead of online via e-mail. If you have a novel idea for a venue for a Hoedown-sponsored event, please let me know. When Townes Van Zandt died last year, Michael Hurley suddenly stood alone as the last great unsung hero of American folk music. He hadn't managed to fly under the cultural radar completely unnoticed -- astute critics seized upon his few performances to laud him as a lost master of incomparable songwriting skills. But to this day, there's no tribute album, no major-label reissue program and no groundswell of popular recognition for the man also known as Doc Snock. So who is Michael Hurley? Long considered a pioneer of "Acid-Folk" along with friends/co-conspirators "The Holy Modal Roudners" (Peter Stampel and Steve Webber), since recording his debut for Folkways in 1965, the twisted troubadour has released about a dozen albums of unwavering quality, sauntering through a distinctive pastiche of blues, country and folk styles and singing undiluted odes to Southern cookin', lovely ladies and animated critters. 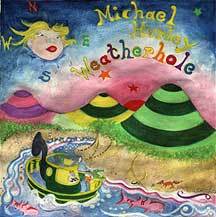 Hurley is also an eccentric painter/cartoonist, with his drawings and watercolors frequently showing up on his album covers. His newest recording, Weatherhole, is out on the New York based Field Recordings record label. The Cosmic Hoedown welcomes the return of Doc Snock, this time with a 7-piece band - local area band The Chabs, who will lend their instrumental skills to backing up Mr. Hurley. This show will also be recorded live for use on Hurley's next record, so this is likely to be an exciting show. The Chabs features a number of well known local musicians, most notably guitar wunderkind Scott McCall from $2-Pistols and drummer Nic Brownnn from Atheneum. Scott McCall has played guitar with The Crowflies and Beat the Reaper as well. He currently plays with Two Dollar Pistols and the Delta Rays. Many local musicians consider McCall one of the finest guitarists in the area. Nic Brownnn plays drums for a variety of local and national bands including Atheneum and Skeleton Key.. After this show Mr. Brown will be relocating to New York City where he will live in a small apartment with the stage manager of the Apollo Theater in the Meat Packing District. Rob Slifkin has played in such local bands as The Crowflies and Beat the Reaper. He is now the singer and guitarist for the Chabs. Wendy Spitzer is a student at UNC Chapel Hill and a member of the UNC Symphony Orchestra. She composes and arranges all of her own oboe parts. Clay Williams is also a UNC student and the principal bassist for their symphony. Lance Sidecar has been playing accordion and other neglected instruments such as the triangle, tenor ukulele, rain stick, and viola for over 20 years, mostly in the streets of Venice Beach, California. He has played with The Crowflies and Benny's Late Afternoon Wind Machine. V.J. Rockefeller plays the accordion for the Chabs. He also performs solo under the pseudonym Jay Cartwright. WTVD-11 came and filmed this show for a newscast special feature. Stay tuned for an online QuickTime video version of the news story! The Bull City Cosmic Hoedown and The ArtsCenter in Carborro are pleased to team up to present "The Paperboys" and their trademark brand of high-energy "Celtic Bluegrass Stompin' Pop" live in concert Saturday July 29 at 8pm at the ArtsCenter. Tickets are $10 General Admission or $8 for ArtsCenter friends. Call 929-ARTS for tickets and more info. Formed in Vancouver in 1992 by Tom Landa, The Paperboys have been tearing up stages across North America with their fusion of Celtic, Bluegrass, Latin & Roots Pop. The band has been praised for their remarkable talent and show stopping performances, which have taken them from Coast to Coast over 16 times. This six piece group has built an impressive following, playing over 180 shows annually for the past 5 years. A major hit at folk festivals, clubs and theaters The Paperboys are a band whose live show has earned them a reputation not only as an accessible high energy act but also as a musical force to be reckoned with. The Paperboys seamless fusion of various musical genres along with savvy songwriting hooks has earned them international critical acclaim. The Paperboys also have a brand new record coming out this week and have just appeared in a major motion picture and have signed a brand new record deal with Red House Records in St. Paul, MN....it is likely that you will be hearing and seeing a lot more from The Paperboys in the next year or two....come out and see them this Saturday night and you can say "I saw them way back when..."
Tickets for this show are ONLY AVAILABLE through the NCMA Box Office (919-715-5923, Tuesday-Friday 9:00am-4:00pm). The show costs $8 to the public, but you can save $3 - ask me how. String swing at it's best!! Don't miss this Chapel Hill favorite -- these guys can really tear up some strings! For years these guys have torn it up at various and sundry Chapel Hill hot spots....now join them for a special concert at the N.C. Museum of Art as part of their Parlour Concert series co-sponsored with The Bull City Cosmic Hoedown. Tickets for this show go on sale Wed Nov 1 at 8pm via e-mail for $10 each. 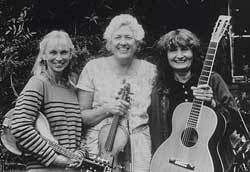 Two Flying Fish albums put out by The Harmony Sisters date from 1981 and 1983 and highlight the varried musical and vocal talents of Alice Gerrard, Irene Herrmann and Jeanie McLerie. Those two records have been re-issued as one compact disc called "The Harmony Sisters: The Early Years". These recordings show an incredible breadth and dept of musical tradition that this trio posesses from all over The Americas. Join us for this concert of three outstanding women vocalists/multi-instrumentalists. Each of these women brings with them a love of close harmony singing and a veritable arsenal of musical styles and instrumental skills across a variety of stringed instruments. Their fluency includes american old-time string band styles, blues, bluegrass, cajun, Spanish, Italian and even classical music -- played on fiddles, guitars, banjos, mandolins, cello and piano. Their friendship and their love of singing and playing american traditional music has kept them together as a group for many many years, even though distance keeps them apart most of the time. It is rare for them to all be in the same town, so don't miss this rare oportunity to see them perform together in an all-acoustic concert in a living room as part of The Bull City Cosmic Hoedown's House Concert Series. As many of you know, Durham's own Alice Gerrard now heads up the Old Time Herald magazine, published in Durham and available nation-wide on newsstands. Some of you are familiar with her ground-breaking bluegrass work with Hazel Dickens, her old-time musc making with folks like Tommy Jarrell or Mike Seeger, and more recently with Tom Sauber and Brad Leftwich as "Tom, Brad and Alice". JEANIE McLERIE has been playing music all her life, since age 7, playing uke, guitar and fiddle, living in London, Paris, Louisiana, California and New Mexico...She has learned much of the music she plays first hand, at the side of musicians in her community. She has been a part of the duo Sandy and Jeanie, The Harmony Sisters, The Delta Sisters, and for the past 20 years, the cajun group Bayou Seco along with her husband Ken Keppeler. Her musical tastes are vast, but she has concentrated on the styles of the American Southwest, Cajun, the Spanish Colonial music of New Mexico, the double fiddle tradition of the Tohono Oodham tribe southwest of Tucson, and the old Spanish songs of the border area. IRENE HERRMANN has played music all her life, but only after she graduated from music school did she discover the world of non-classical music and started dividing her time between classical piano and cello and traditional music. She feels strongly that elements of both are part of all of her music. The world of traditional music opened many doors for her, not only musically, but socially and culturally as well. She has played cello on Joe and Antoinette McKenna's second album, orchestra bells on the second album of R. Crumb's Cheap Suit Serenaders, recorded on mandolin with vaudevillean Roy Smeck, and on fiddle with gospel singer Marion Williams. With Paul Hostetter, she formed a string band with friend and traditional Italian mandolinist, Riccardo Tunzi, playing the traditional music that Riccardo taught them, until he passed away several years ago. They now continue that tradition in a trio with Italian mandolinist Tony Flores. Irene was pregnant during the last Harmony Sisters tour, and she now has two teen-age girls who are also fine musicians. These days Irene is primarily a pianist, specializing in the music of Paul Bowles and other 20th century American composers. She performs in new music ensembles, with choirs and in chamber music in the Santa Cruz, California region where she makes her home. "Making and sharing all kinds of music with my friends is the greatest joy I know. Tickets for this show go on sale Thurs Jan 18 at 7pm via e-mail for $10 each. In the early seventies, Jim Watson, Tommy Thompson, and Alan Jabbour were playing and recording as "The Hollow Rock String Band", being one of the seminal old-time string bands to emerge from the Durham/Chapel-Hill area in the mid-sixties and eventually giving birth to groups like "The Fuzzy Mountain String Band" and "The Red Clay Ramblers" among others. No one can say for certain when the Hollow Rock String Band was created, but the original members started playing together in the mid-1960's and took the name as a band (named after a rural Durham community) in order to compete in an old-time fiddle contest in the N.C. Mountains. The original band included Tommy Thompson, Bobbie Thompson, Bertram Levy and Alan Jabbour. The HRSB recored an album in 1967 (initial pressing: 500 copies, released in 1968) and continued to play until Jabbour and Levy moved out of state. 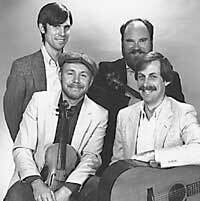 Bobbie Thompson went on to form the Fuzzy Mountain String Band and by 1972 Tommy Thompson, Jim Watson and Bill Hicks would form The Red Clay Ramblers. In the meantime, Jabbour, Thompson and Watson continued to occasionally gig as The Hollow Rock String Band and eventually recorded an LP for Rounder Records (0024) entitled "The Hollow Rock String Band". Long time friends Jim Watson (perhaps best known for his former work with the Red Clay Ramblers and now with Robin and Linda Williams and Their Fine Group) and Alan Jabbour (Founder and Director of the American Folklife Center in the Library of Congress) team up for a rare evening of old time music in this special show. Old-time, bluegrass, country music fans, Red Clay Rambler fans and fans of great songwritng will all want to make it to this special concert featuring two of the area's favorites together again... As Jim Watson is wont to say: "Mighty Fine....Mighty Fine..."
ALAN JABBOUR: While a graduate student at Duke, Alan Jabbour became interested in folk music and folklore, and in 1965-68 he made extensive trips in North Carolina, Virginia, and West Virginia, where he recorded instrumental folk music, folksong, and folklore on tape. 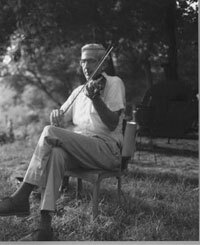 As he began to learn the regional fiddling style and repertory, he joined together with three other young musicians to form a band devoted to playing these oldtime tunes, including Tommy Thompson on the five-string banjo, Bertram Levy on the mandolin, and Bobbie Thompson on the guitar. They called themselves the "Hollow Rock String Band", after a rural community outside of Durham where the Thompsons lived and where the band gathered for regular jam sessions and music parties. The band was at the core of an oldtime music scene that blossomed in Durham and Chapel Hill in the later 1960s. In September 1969 Alan was appointed head of the Archive of Folk Song (now the Archive of Folk Culture) at the Library of Congress. There he supervised the development of the national archival collection for folk music and folklore. He edited a long playing record drawn from earlier recordings in the Archive, which was published in 1971 as American Fiddle Tunes. With Carl Fleischhauer, he undertook a three-year project to research, record, and photograph the history and traditions of a single Appalachian family. This was published in 1973 by the Library of Congress in a two-record album entitled "The Hammons Family: A Study of a West Virginia Family's Traditions", which was recently re-issued on CD by Rounder Records to critical acclaim. 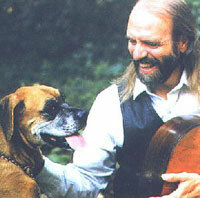 In April 1974, Alan moved to the National Endowment for the Arts to become founding director of that agency's grant-giving program in folk arts. Under his direction the Folk Arts Program grew rapidly as a source of funding for the varieties of folk cultural expression in the United States, and it continued to grow after his departure in 1976. In August 1976 he became the founding director of the American Folklife Center in the Library of Congress, continuing in that position for 23 years until he stepped down as director in mid-1999. Established by the American Folklife Preservation Act of 1976 (Public Law 94-201), the Center is directed to "preserve and present American folklife" through programs of research, documentation, archival preservation, live presentation, exhibition, publication, dissemination, training, and other activities involving the many folk traditions of the United States. One of the many projects developed by the Alan at the Center is a large collection of fiddle music from Henry Reed, a huge influence on Alan in the 60's. 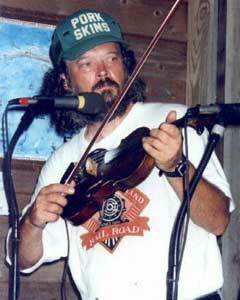 Alan spent much of the mid sixties visiting and documenting the fiddle music of the late Henry Reed from Virginia. Henry was in his 80's at the time, and his music and charm provided much original material for the budding old-time music scene in Durham/Chapel Hill back in the 60's when The Hollow Rock String Band was taking flight. Alan Jabbour retired from federal service at the end of 1999. In celebration of his retirement, he has resumed playing the fiddle more actively and is planning a number of appearances and engagements as a musician and fiddle teacher. JIM WATSON:Guitarist/Mandolin-player/bassist/singer/road-warrior Jim Watson (best known for his incredible vocal and mandolin work with Chapel Hill's Red Clay Ramblers back in the 70's and 80's) spends his time these days on the road playing bass and singing with the hard-working, hard-touring Robin and Linda Williams and Their Fine Group, which appears on "Prarie Home Companion" frequently. Jim is widely recoginized in bluegrass, country, and oldtime music circles as an amazing singer, able to hit those high tenor notes with ease as well as fall in with multi-part harmonies at the drop of a hat. His love of early Carter Family and Jimmy Rogers tunes shows through in everything he does. 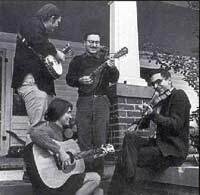 In the early seventies, Jim Watson, Tommy Thompson, and Alan Jabbour were playing and recording as "The Hollow Rock String Band", being one of the seminal old-time string bands to emerge from the Durham/Chapel-Hill area and eventually giving birth to groups like "The Fuzzy Mountain String Band" and "The Red Clay Ramblers". When not playing with Robin and Linda Williams, he can on rare occasion be seen with The Green Level Entertainers, one of the finest bluegrass groups rarely heard. Two years ago we saw the release of Jim Watson's solo record "Don't Tell Me, I Don't Know" (on Chapel Hill's fine Barker Records label) - which featured a regular who's who of local and nationally known players and lots of old friends of Jim's. These days it is rare to see Jim Watson in concert in these parts, as he is busy on the road with Robin and Linda Williams. Some folks may also remember last year's Cosmic Hoedown House Concert with Jim Watson and Mike Craver....if you missed this show, you can read about it here, thanks to the writing of Allison Lee and all the hard web-work of Bren, who maintains the wonderful "Original Red Clay Ramblers Site", from which many of the links in this article point to. Also, one last note: Just by pure co-incidence, it seems that the curent lineup of The Red Clay Ramblers is playing a two night gig Friday and Sat Jan 26-27 at the ArtsCenter in Carborro!! So now you have to go see that show also! Tickets for this show go on sale Thurs Feb 15th at 8pm via e-mail for $10 each. The Revelators are based in Raleigh, NC and play music that is inspired by traditional country, 1970s rock, and most importantly, the South in which they live. The group features the sterling vocal work of singer Kim McPhatter along with former members of $2 Pistols (David Newton on Drums) and Six String Drag (Scott Miller on lead guitar) for a great country/swamp-rock sound. Lead singer Kim McPhatter was most influenced by Emmylou Harris, Linda Ronstadt and Jackson Browne when she was growing up, while lead guitarist and songwriter Scott Miller was under the spell of both Johnny Cash and Led Zeppelin. Together McPhatter and Miller create their own unique style of swampy Southern rock music that would make William Faulkner proud. Lead vocalist and guitarist Kim McPhatter has been performing in projects around the Triangle for nearly 15 years. Former projects include Timbre Thieves and The Lowlanders (both with Scott Miller) and Adam's Ruin (with Miller and ex-Backslider Steve Howell). She also occasionally sings and plays guitar with Steve Howell in a traditional country/bluegrass combo. Lead guitarist Scott Miller played with Kenny Roby in the Raleigh band Six String Drag. He was an integral part of the texture and sound of the band's critically acclaimed "High Hat" CD (E-Squared) that was produced by Steve Earle. 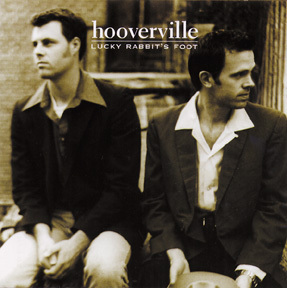 Other former projects include Timbre Thieves and The Lowlanders (both with McPhatter), Econoline, and Available Jones (with Steve Howell and Chip Robinson). In addition to the Revelators, Scott is also lead vocalist/guitarist for the Raleigh duo Blue Lena. Drummer David Newton was most recently a member of Chapel Hill-based Two Dollar Pistols and played on the "Two Dollar Pistols with Tift Merritt" EP (YepRoc Records). As a multi-instrumentalist, he often does session work for studio recordings. Bassist Mike Tutt has played in several Raleigh bands including Festus and Mind Over Matter. David Newton met Mike while he was sitting in on bass with Two Dollar Pistols on the promotional tour of the "Two Dollar Pistols with Tift Merritt" EP. John Bemis and Greg Hanson weave tight harmonies along with lively guitar playing (including Hanson's stellar hot-picking and soloing) and occasionally pulling out mandolin or fiddle that harkens back to early country groups where tight harmonies and intricate instrumental work created a sound that is far more powerful than what a simple country ballad might be in the hands of lesser musicians. Although their sound brings back memories of a time long ago, almost all of the songs they perform are their original compositions, further showing the talent these two posess. Gigging out these days with bassist Paul Dowds, the trio makes a powerful and moving sound that pulls the listener in close...perfect music to hear in the intimacy of a living room! Tickets for this show go on sale Wed March 7th at 8pm via e-mail for $10 each. Once again, The Bull City Cosmic Hoedown delves into the oldtime music scene of the Durham/Chapel Hill area and pulls out Bill and Libby Hicks - a husband and wife duo that have been playing oldtime, country and blues music in North Carolina for quite a spell... Bill is probably best known for his work as a founding member of The Red Clay Ramblers and his playing with The Fuzzy Mountain String Band, two mainstays of the Triangle oldtime music scene (like, way back when, before it was called 'The Triangle' or before it was full of Oldtime music!) Libby is known onstage for her work playing early country and blues duets with Farmville based Lightnin' Wells as well as offstage for her fine glass artwork. Bill and Libby have been together as musical and life partners for a while now, and have recorded a wonderful record of oldtime and original tunes called South of Nowhere that is to be released in late March on the Copper Creek Records label. In celebration of their new record please join us for an evening of wild & wooly oldtime, original and otherwise unpredictable music. BILL AND LIBBY HICKS have been mainstays of the NC traditional music scene since the 1970s. Libby was the harmonizing half of a duet with Lightnin' Wells for seven years. They specialized in the old-time "brother duet" style of singing-- (with Libby playing guitar and singing Charlie, Earl, Ira, or Alton's parts usually, depending on which pair of brothers they were "borrowing from"-- or rather "paying tribute to" at the time). With a repertoire of hundreds of songs, they did paying jobs when they could find them-- at bars (perfect for the drinking and prison songs), victory parties for losing candidates, and the odd concert spot that family members coerced bosses and friends into hiring them for. In addition, they not only accepted but sought out opportunities to entertain for free any group that would appreciate the old sentimental songs--which meant hundreds of performances at church picnics, senior citizen groups and nursing homes (the optimum audience--they knew the words to all the songs and couldn't leave the building.) The only recordings that remain of that duet are somewhat bootleg and get swapped around sometimes at festivals. Bill, at the same time, was finding fame if not fortune touring the United States and Europe in funky vans as a founding member of the Red Clay Ramblers. He made a name for himself all over the map with his energetic fiddling, developed over years of seeking out and learning literally at the feet of the old masters such as Tommy Jarrell and Burl Hammons. His mom was mighty proud when the band performed off-Broadway in 1975 in the smash-hit play Diamond Studs. Bill also has made a place for himself in thousands of record (and now CD) collections with a long string of recordings with the Ramblers, featuring his fiddling as well as some original songs. 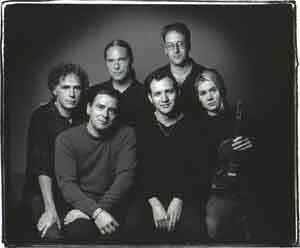 In 1995, the Merle Watson Festival sponsored a reunion of his first band, the Fuzzy Mountain String Band, to celebrate the reissue on CD by Rounder Records of their early '70s recordings of fiddle tunes, still recognized as the "gold standard" of string band music. For more info on Bill's career, see http://redclayramblers.tripod.com/ a website devoted to the original band and it's members. Performing together since 1982, Bill and Libby have had plenty of time to merge minds and styles and have developed a sympatico duet style on fiddle, guitar and keyboard that often makes people check to see if it really is only two people playing. In the past 10 years, along with performing and playing for dances, they have turned their attention to passing along the fun of old-time music. On several occasions they been on the staff of the Augusta Heritage Workshops on the campus of Davis and Elkins College in WVA, teaching musicians from all over the world about the distinguishing points of southern Appalachian fiddle and guitar styles and old-time string band singing. 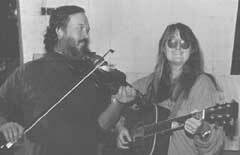 Bill and Libby's musical universe expanded further in the mid-'90s when they were invited to join the Unknown Tongues--that mystico-morphic cajun-zydeco dance band of the Down-East coastal NC bayou. They are indebted to Bryan and Barbara Blake for expanding their musical horizons to include among other pinnacle experiences, the Morehead City Seafood Festival and the Gloucester Mardi Gras (both of which they would urge you not to miss)! Cover of the upcoming record by Bill and Libby, complete with Libby-produced glass/tile artwork. 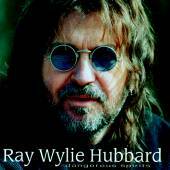 You may have seen Ray Wylie at our House Concert back in November of 1999 when The Cosmic Hoedown brought Ray to town for the first time in about 15 years or so...It was at that show that we also had a suprise visit from the NY Times doing a story on House Concerts and featuring Ray! Since Ray is coming back this month, you won't have to wait another year and a half (or another 15 years for that matter! ).